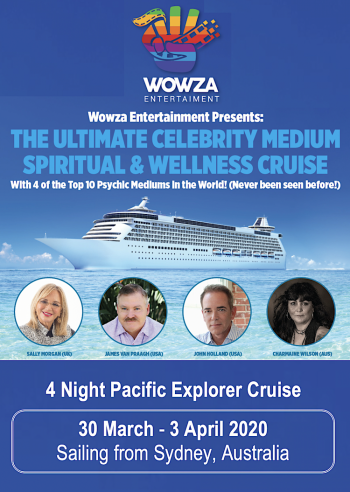 Cruise of a Lifetime with 4 of the Top 10 Best Mediums in the World!, I'll be joined by: Sally Morgan (UK), James Van Praagh (USA and Charmaine Wilson (AUS). You'll experience separate "Live" audience reading with all 4 Mediums. Extremely Limited Tickets! You Do Not Want to Miss this Cruise of a Lifetime! Book & Pay your Deposits Today! Cruise must be Booked with deposit paid by 15th May 2019 (45 Days) in order to be part of this Cruise! England has always been a special and mystical place to me, as a result of spending 2-years studying psychic sciences and mediumship there some years ago. The memories and experiences I had there still remain with me to this day, and that's why I've always wanted to take a small group there so they too can feel and see the beauty and enchantment that England and its sacred sites has to offer.